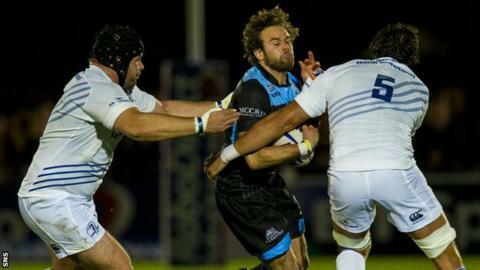 Scotland fly-half Ruaridh Jackson is leaving Glasgow Warriors to join London Wasps for next season. The 26-year-old scored 443 points during his six years with the Scotstoun club, including eight tries. "I'll take a lot of good memories with me," Jackson told the Warriors website. "I've had the opportunity to play in some massive games." Speaking to the Wasps website, he added: "I can't wait to start the next stage of my rugby career." Jackson won the first of his 23 caps against New Zealand in 2010 but played no part in this year's Six Nations. Wasps director of rugby Dai Young said: "I've been very impressed with what I've seen of Ruaridh. "He will add to the quality pool of 10s we already have and the competition for that position next season will be very strong." Jackson, who has made 108 appearances for Glasgow, added: "I'm very excited about joining Wasps. "I've been at Glasgow a long time, but I'm now relishing this new challenge that lies ahead. "After meeting Dai, I was very impressed with what the club has to offer and it's easy to see the club is going in the right direction." Warriors head coach Gregor Townsend, who can call on Duncan Weir, Finn Russell and Peter Horne at stand-off, praised Jackson for his service. "Ruaridh has been a fantastic ambassador and been a key driver of the club's improvement in recent seasons," he said.